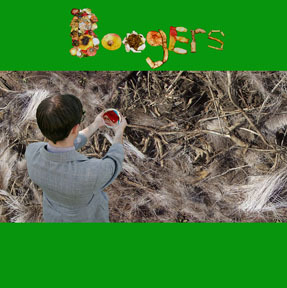 BOOGERS is a noise-collage album chronicling various ideas that point in the direction of some strange thoughts. Most of the material comprising the collage was made by Doggy P. Lips independently of D. Petri, then mailed to Mr. Petri in a series of packages over a few years, and finally organized and arranged for final output in April 2010. Consisting largely of low fidelity cassette recordings of guitar noise/heavily effected guitars/speaking and field recordings, BOOGERS is an attempt by Doggy P. Lips to describe some type of insight or ephiphany he had in 2006 regarding organic composition/decomposition and death. Often Mr. Lips expresses his amazement at these matters with deliberately comedic incredulity. This tendency is quite apparent in several parts of the recording. By the end of the recording you have walked at least 5 steps with your right foot at least one third of the way into one of Doggy P. Lips' boots. It's an intense and strange 5 steps, you can be sure. Full color printed disc comes in handmade 6 panel digipak replica - lacking tray - instead the disc slips inside the middle panel. All laser printed heavy cardstock. Listen to the whole album and DOWNLOAD for $7 HERE.